In this tutorial, we are going to use Android SDK and the Kotlin language to build a simple run-tracking mobile app. This app should be able to track the user’s running data, including run time, duration, distance, and location. To accomplish that, we will access the device GPS and use it to show the user’s location on Google Maps. Afterward, the data should be backed up in the cloud so that the user doesn’t have to worry about losing their data. We’re going to use the IBM Cloudant NoSQL DB service to provide the backend for our app. Now that we have an idea of what kind of application we are going to be building, let’s start with the development process. If you have never built an application with Android Studio before, you might want to work through the “Developing your first Android application” tutorial first. As always, the first step when creating an Android app is to set up the development environment. Fortunately, it’s easy to do using the Android SDK. You simply have to download Android Studio and install it on your system. Once the installation and the initialization are done, you will have all of the necessary tools to start your Android project. The next step is to create a new Android project using Android Studio. In the dialog menu that pops up, don’t forget to activate Kotlin support, because that’s the language we’re going to be using. We’re going with Kotlin instead of Java™ for our app because Kotlin requires much less code compared to Java, which results in faster code writing. As for the API level, you should go with API level 15 because our app doesn’t require advanced features that exist in the latest SDK. The last part in the project creation process is the main Activity of the app. For our run-tracking app, the main activity should show a list of all previous runs and a button to track a new run. So, with that in mind, let’s name it HomeActivity and use Basic Activity as the template for our initial Activity (see Figure 1). And with that, we have a new Android project that is ready to be worked on. We will use the Activity we just created, HomeActivity, as the Activity that shows a list of runs. However, we don’t have any run data to list yet, so let’s first create the Activity that will track the data. Create another Activity, and this time name it TrackActivity, with Empty Activity as the template. Now you should have two Activity files in our project folder, as you can see in Figure 2. Now, when the Floating Action Button (FAB) on HomeActivity is clicked, the app will open TrackActivity. 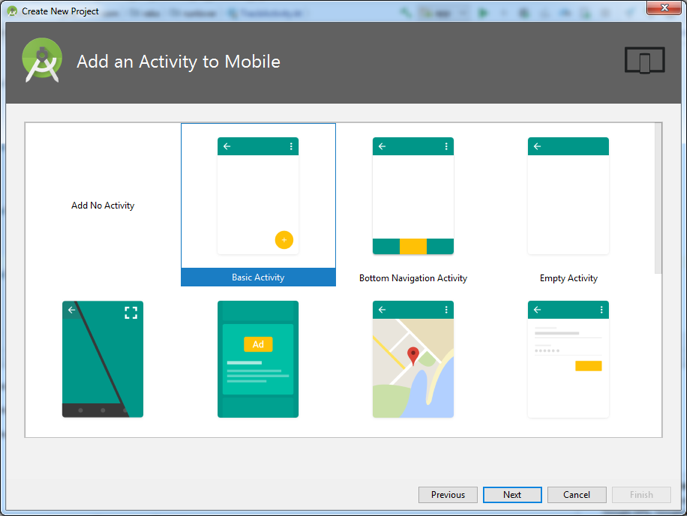 Create another Activity, and this time name it TrackActivity, with Empty Activity as the template. Now you should have two Activity files in our project folder, as in Figure 2. In the TrackActivity screen, there are two main things that we should track. The first is run duration and the second is the route of the run. Let’s start with tracking run duration. To track run duration, add a button that the user can use to toggle the tracking process as well as a timer that counts how long the run is taking place. We can add the necessary interface component to res/layout/activity_track.xml with the XML lines in the following listing. If you run the app and open TrackActivity, it should show a user interface similar to Figure 3. So, how does our timer system work? Before starting the Handler loop, it first records the system’s current millisecond with the System.currentTimeMillis function. 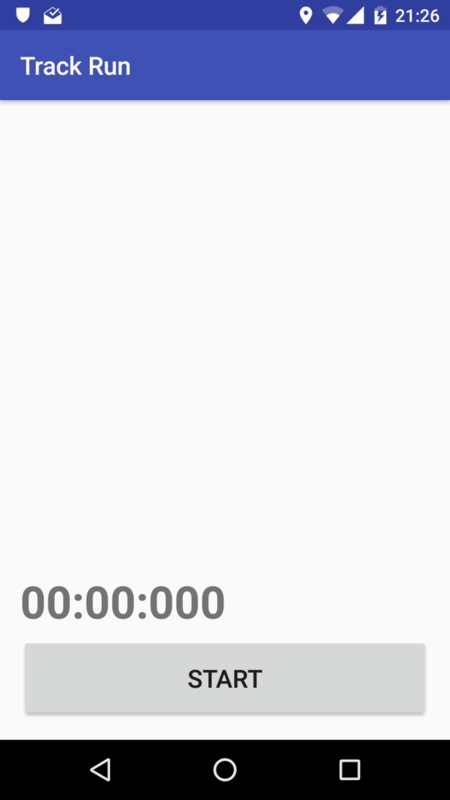 Then, inside the Handler loop, it simply counts the current time difference to get tracking duration and update the text. After that, we call the same Handler function again with a delay of 20 milliseconds. And lastly, don’t forget to stop the handler with the removeCallbacksAndMessages function when user stops the tracking. 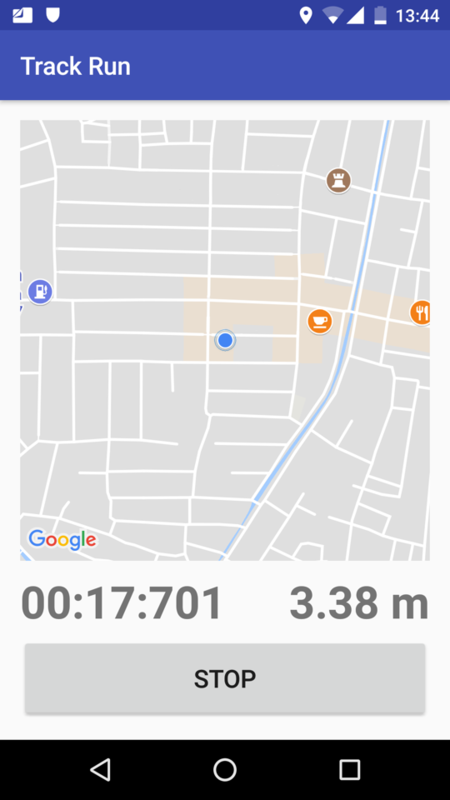 After adding MapView and a distance counter to TrackActivity, the Activity should look like Figure 4. The other part is to actively request the user for permission when the app is running. 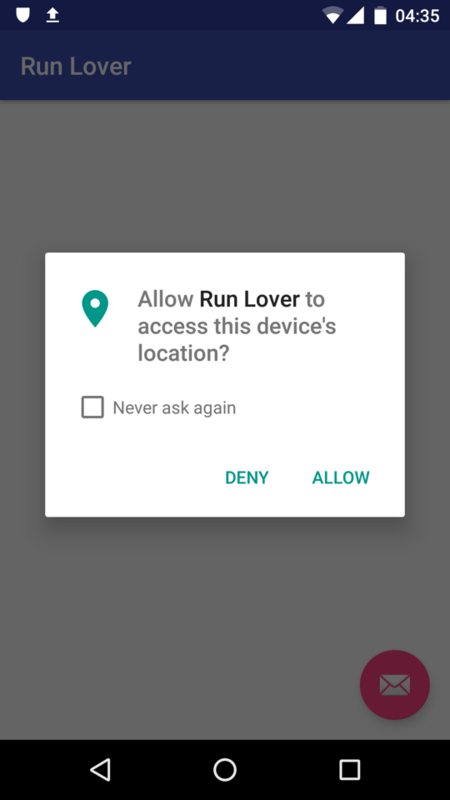 In this app, the best place to ask for permission is right before the user enters TrackActivity. So, let’s get back to HomeActivity for a moment and modify the FAB click listener to include permission checking, as can be seen in the following listing. Now, whenever we try to open TrackActivity in our app, it will ask the user for location permission if it hasn’t been given before (see Figure 5). This way, we won’t encounter any permission issue inside TrackActivity. With the MapView implemented, we can move on to tracking the user’s position, or the route of the run. We can get the user’s continuous position by using the FusedLocationProviderClient API and by calling the requestLocationUpdates function. 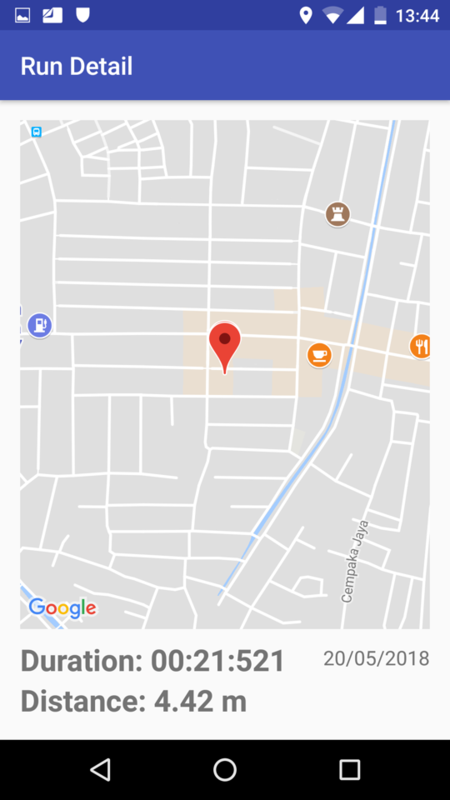 Before calling that function, we should configure what kind of location data that our app needs and how often we want it. We can do that by instantiating a RequestLocation object and then specifying the interval and priority parameter. Then, after we get the position data, we should update the MapView position with map.moveCamera() function. We should also save the latest position data and compare it to the previous data using Location.distanceBetween function so that we can calculate how far has the user moved since the last position update. And that’s it for the run tracking functionality. If you run the app and try to track a run, it should display a screen similar to the one in Figure 6. 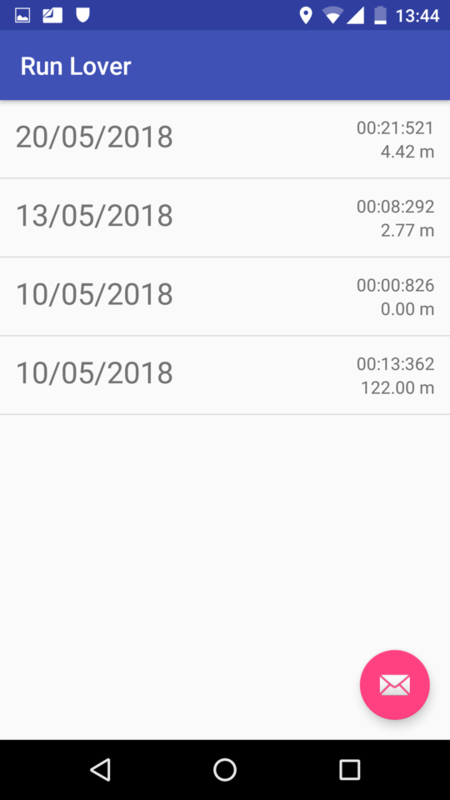 Now that our app can capture the data of a run, it should also be able to display it again, so let’s implement data display functionality for our app. To do that, we should create our third Activity that we can use to show the details of a run. Before we create this Activity, let’s first create a class that holds the data of a run and is capable of exporting and importing a HashMap of said data. The latter point is important, because we’re going to move the data around between activities and between client-server as a HashMap. We’ll call this class RunData, and the full implementation of that class can be in the RunData.kt file in my runlover Github repo that contains all of the code for this project. const val EXTRA_DATA = "data"
Before you can display the data, you need to add a few interface components on the Activity. The layout for DetailActivity is similar to TrackActivity, with a MapView and a couple of text views to display the data of a run. You can use the XML codes in my activity_detail.xml file to set up the necessary interface to DetailActivity. If you run the app and save the run data, the app should look similar to Figure 7. And with that, we’ve finished implementing the data display functionality of the app. The app shouldn’t only capture and display the user’s run data, it should also store it to the cloud. To add this functionality, first you need to set up the backend server that will store this data. Instead of creating your own backend system, we’ll use the IBM Cloudant NoSQL DB service as the backend for our app. By using this service, you don’t have to worry about provisioning or configuring the remote server, and you can fully focus on building the mobile app. 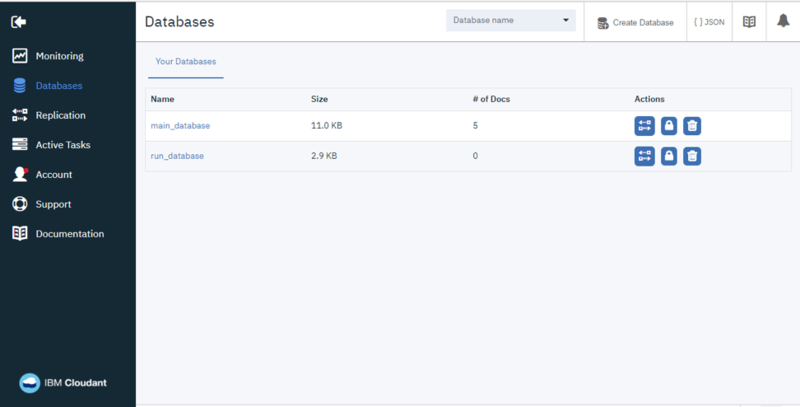 Setting up the Cloudant NoSQL DB service is simple. First, log in to your IBM Cloud account and use it to create an instance of the Cloudant NoSQL DB service from here. Then, after the service is created, launch the service dashboard and access the Databases menu on the left. You need at least one database here, so create a new one using the Create Database button at the top, and remember the name of this new database. That’s it for setting up the service. The backend is ready to retrieve and store data. That said, don’t close the dashboard just yet, because we’re going to need it again very soon. The Cloudant Sync library has two major functionalities that we are using in our project. The first one is the DocumentStore API that handles storing and retrieving the data locally on the device, which allows our app to operate even when offline. The other one is the Replicator API that handles replicating or syncing local and remote data. Using these two functionalities correctly is key in connecting our app with the backend. To connect our mobile app with our Cloudant NoSQL DB service, we have to provide the library with the proper URL. You can get this URL from the IBM Cloud dashboard we opened earlier. Go to the Service credentials menu on the left, and open the single credential entry in the list; the URL address that we need should be written there. We have everything we need to connect to the backend, so it’s time to implement the cloud functionality in our app. In the save button, click listener on TrackActivity, add the following code to save the run data locally, and then upload it to the remote database. We can store run data on the backend by first creating a DocumentRevision object containing the run data. We then store this object on a local file by calling the database.create function of the DocumentStore API. Afterward, sync it to the remote database by calling the push function of the Replicator API. That’s all you need to do to send data to the backend. Our app is now capable of storing data in the cloud, but why do that if we’re not going to retrieve the data again? That’s exactly what we’re going to work on next. Let’s go back to the first Activity we created, HomeActivity, and have it display a list of all runs the user has done. Right now, we have a working TrackActivity that tracks the user’s run data and a working DetailActivity that shows a user’s run data. 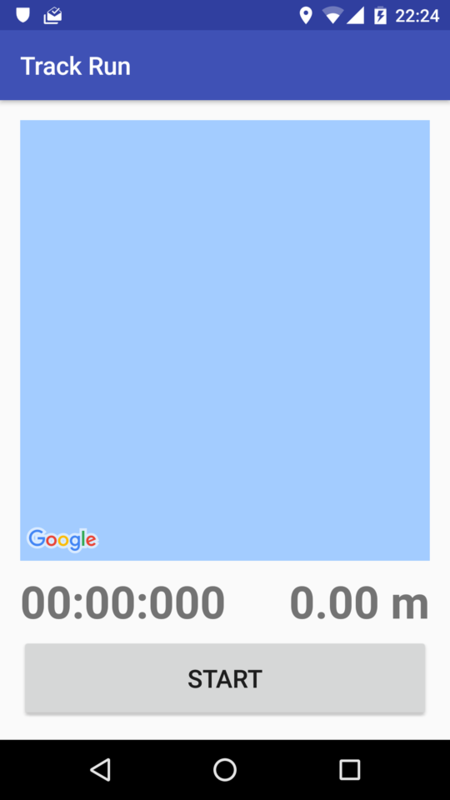 All that’s left is an Activity that shows all the previous runs that the app has tracked. So, let’s get back to HomeActivity and make it show a list of run data. RecyclerView is essentially an interface component to display multiple items in list, grid, or other formats. To define how each item in the list would look, we have to create a separate layout file for those items. Use this XML file, and put it on the layout folder so that you can later use it for the data list. Just like how a RecyclerView has two separate layout information, displaying data on it also requires two separate classes. One of these classes is RecyclerView.Adapter, which handles the full list of items to be displayed. The other one is RecyclerView.ViewHolder, which should handle how each item would be presented. And with that, our app should properly display a list of the user’s run data on HomeActivity, as can be seen in Figure 9. If you run the app, you should be able to quickly access the detail of each run by tapping the item on the list. We’ve implemented all of the required functionalities, so all that’s left to do is to build the app with the Build > Build APK(s) menu. That’s it. You now have a fully functioning mobile app that can track user’s run data and store it in the cloud. There are some minor details like displaying position marker on the map that aren’t included here, but you can check out the full project in my GitHub repo for yourself. Now that you know how to build an Android application from scratch, there are many options that you can try next. You can build a new app that interests you, or you can learn further by adding even more features to this app. It could be as simple as adding a delete run feature, or it could be as complex as adding an authorization system.